พร้อมจะโกโมบายหรือยัง - Are you ready to Go Mobile? 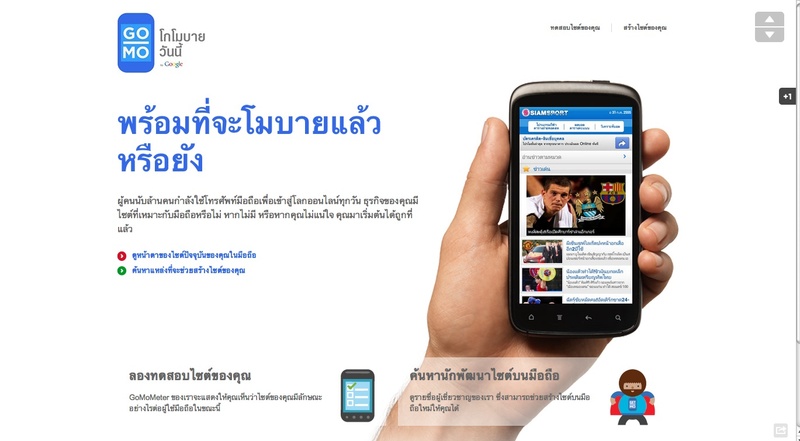 In Thailand, 4 out of 5 businesses’ websites don’t work well on smartphones, yet 1 in 3 Thais now own a smartphone. Its time business re-think mobile. One of the most important things you can do to grow your business using the mobile web is to create a mobile-friendly website: a website designed specifically for mobile users and mobile devices. It should be fast to load and easy to use—no pinching and zooming required. Research shows that 71% of smartphone users expect a mobile site to load as fast as a desktop site and 40% of users have turned to a competitor’s site after a bad mobile site experience. Your customers have high expectations about their mobile experience, are you living up to them? 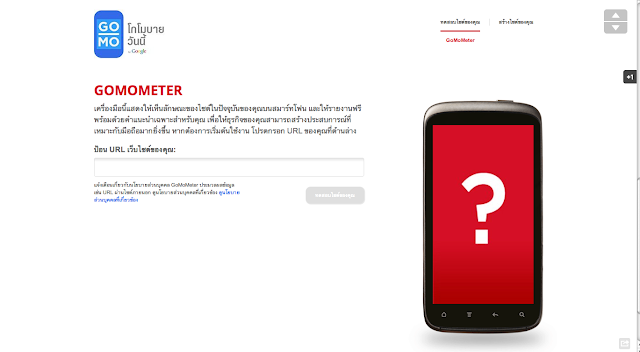 Not everyone knows how to get started on mobile, so today we’re launching an initiative called GoMo that helps businesses “Go Mobile” by showing them how their website looks on mobile with a smartphone simulator called the GoMoMeter, and then providing a personalised report to help you figure out what to do to make your site more accessible on mobile. 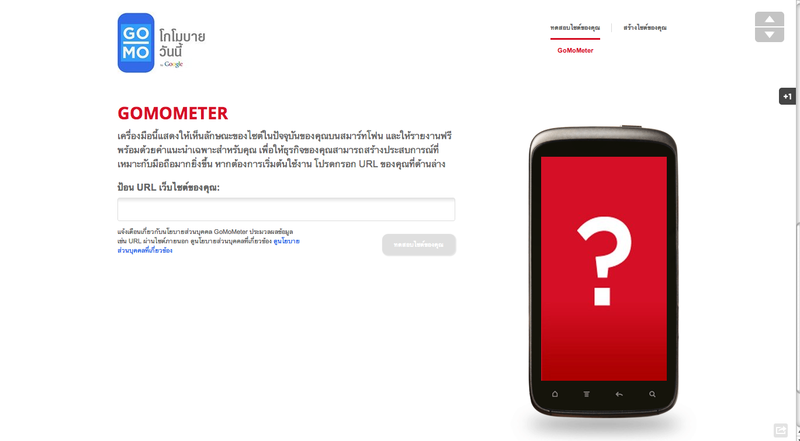 To find out whether you’re ready to Go Mo, visit http://www.howtogomo.com/th/ Enter your website’s URL and see how your site performs on mobile phones with the GoMoMeter. The GoMoMeter will analyse your site and give you customised recommendations on how to make your site more mobile-friendly. You can even download a free customised report! Visit the “get started” link under “build your site” menu to find a selection of mobile site developers who can help your business go mobile today with a mobile optimized site. Whether you’re looking to do it yourself or for a full service vendor, this website can help you choose the right solution for your website. Every day more and more of your customers are looking for you using their mobile devices, and if your site isn’t mobile-friendly chances are you’re missing out. 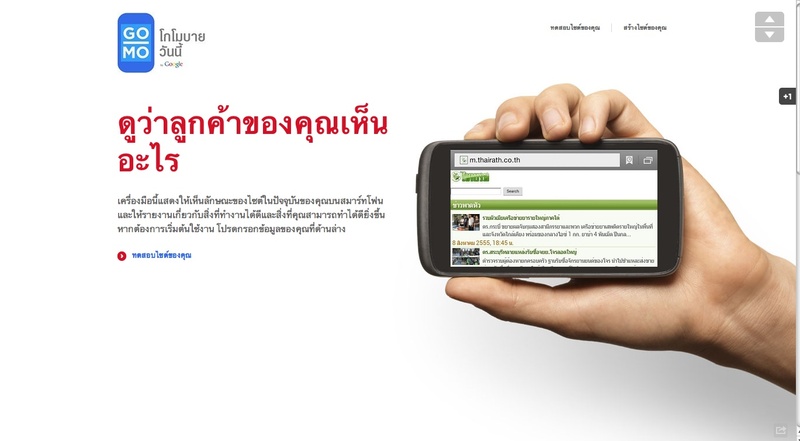 So don’t shut the door on mobile: visit http://www.howtogomo.com/th and take the first steps towards going mobile, today.